At the foot of our garden in White Plains, New York in the 1950’s was a shallow stream that ran down to Saxon Woods Wild Park. The stream flowed down to a little falls, emptied into a larger stream, then wandered off and disappeared into the dark thickets of the Wild Park. Undeterred by the water moccasins that lived in the rocky banks of the water, my brothers and I had a yen to sail down our stream to the falls. The problem was that we didn’t have a boat. Dad wouldn’t allow us to expose the tender canvas bottom of our folding Folboat kayak, the Yatch, to the rocky bed of the stream. So we had to build one. A bigger problem was that none of us knew how to do it. The boys had some experience with tools, garnered in male-only classes in “shop.” They had constructed useful items like birdhouses and jewelry boxes, but nothing on a grand scale. Even worse, as a girl, I had been relegated to Home Ec. There, to my mother’s dismay, (she was a Domestic Goddess!) the only skill I acquired was the ability to sew a not-so-fine seam. That meant that the only contribution I was qualified to make to our project was to create a sail. None of these facts discouraged us in the least. 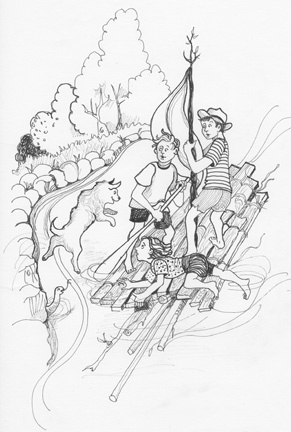 My brothers borrowed some wood and planks from the woodpile and garage, and clobbered together a kind of Huckleberry Finn raft, with a shaky mast stepped in the middle. As for me, the sail-maker, No Problem! I swiped one of Mum’s old sheets from the linen cupboard, and tore it down to size. The great moment came for us to launch. I can’t remember now what the raft was called, or whether we christened it with a bottle of Coke. Frankly, I doubt we stood on ceremony. We were too eager to get started. Bill, of course, was the captain. It was his job to stand erect on the raft, holding the mast steady, and looking brave. Jim was first mate. He knelt at the back, steering the raft with one of the paddles from the Yatch. I was the crew. It was my job to squat in the middle, keeping a sharp eye peeled for rocks, or water moccasins. Judy, our sea-going, snake-hunting terrier, was banished to the banks of the stream for the maiden voyage. Off we went. The raft had an alarming tendency to sink. Soon, we were scudding along, at least 2 inches below water. But we were still more or less holding together. We were elated! “This is GREAT!” one of us yelled. It might have been me. Suddenly, I spotted a snake, nosing out of the rocks along the banks of the stream. It paused, and seemed to scope us out. No wonder! We were ankle-deep in the stream by now ~ an attractive target for a hungry serpent if ever there was one. A series of catastrophes followed. SNAKE was a battle cry in our family. Mum, weeding in the rockery, heard and took up the challenge. She gave no quarter to snakes, having spent the early years of her married life beside the jungles of Java, Borneo and Trinidad where cobras, anacondas and other unpleasant creatures abounded. “SNAKE, Judy, SNAKE!” she bugled, sprinting for the garage and her trusty cutlass. That was Judy’s call to attack. She hurled herself from the bank of the stream where she had been sitting, trembling with indignation at our refusal to let her join us, and landed, splat, in the middle of our raft. It rocked wildly. Bill lost his grip on the mast, which toppled over with him. Jim somersaulted over his paddle into the water. I fell over and followed the boys into the stream, amidst the wreckage of the disintegrating boat. “SNAKE!” I yelled again in a panic. I leaped out of the stream in a mighty bound that would have won me a spot in the Olympics had anyone been paying any attention. We never found the snake. It vanished back into the rocks. Mum put her cutlass back in the garage and returned to weeding. But not before she ordered us to retrieve all the wood and stuff that had puddled up at the head of the falls. Some things just can’t be repeated.